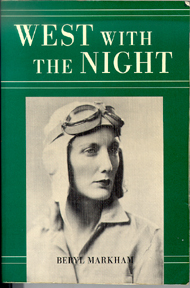 Beryl Markham. North Point Press, San Francisco, 1942. (reprinted as a paperback in 1983). The book you will end up giving to your friends. Beryl Markham was raised in East Africa at the turn of the century, on a working farm in a wilderness that no longer exists. As a young adult she began to fly airplanes, and from 1931 to 1936 carried mail and passengers in her small plane to remote corners of Africa. Taught by famous hunter Denys Finch-Hatton (played by Robert Redford in the film Out of Africa) to scout elephant by air, she flew “spotting elephant” for Baron von Blixen (ex-husband of Isak Dinesen, author of Out of Africa), and in 1936 she became the first person to fly solo across the Atlantic from east to west (hence the title of the book). Against this backdrop of rapidly changing times, she writes with great beauty and eloquence of an Africa we will never see.